ეს არის გამოქვეყნებული ვერსია, შემოწმებული 6 ნოემბერი 2017. არსებობს შემოუწმებელი რედაქტირება ფაილებში ან თარგებში. მონრეალი (ფრანგ. Montréal) — ყველაზე ხალხმრავალი მუნიციპალიტეტი კანადის კვებეკის პროვინციაში და მეორე ყველაზე ხალხმრავალი მთელ კანადაში. მიჩნეულია, რომ ერთ დროს ვილ-მარის სახელით (ფრანგ. Ville-Marie — მარის ქალაქი) ცნობილი ქალაქის ამჟამინდელი სახელი მონ-რუაიალის მთიდან მომდინარეობს, თუმცა, ამასთან დაკავშირებით ერთიანი აზრი არ არსებობს. ქალაქს აქვს ოთხ-სეზონიანი კონტინენტური კლიმატი, თბილი-ცხელი ზაფხულითა და ცივი, თოვლიანი ზამთრით. 2016 წელს, მონრეალის მოსახლეობა 1 704 694 ადამიანს შეადგენდა. მის მეტროპოლიური ზონაში 4 098 927 ადამიანი ცხოვრობს, ურბანულ აგლომერაციაში კი 1 958 257. მონრეალი ძირითადად ფრანგულენოვანი ქალაქია; მოსახლეობის 60,5% სახლში ფრანგულად საუბრობს, 21,2% ინგლისურად, 19,8% კი არც ერთ მათგანზე. მონრეალი კანადის ყველაზე ბილინგუალური ქალაქია, რადგან მისი მოსახლეობის 56% ორივე სახელმწიფო ენას ფლობს. გარდა ამისა, მონრეალი მეორე ყველაზე დიდი ფრანგულენოვანი ქალაქია მთელ მსოფლიოში, პარიზის შემდეგ. 1970-იან წლებში, კანადის ისტორიულ კომერციულ დედაქალაქს როგორც მოსახლეობით, ისე ეკონომიკური სიძლიერით, ტორონტომ გადაასწრო. მიუხედავად ამისა, მონრეალი დღემდე რჩება კანადის მნიშვნელოვან ცენტრად კომერციაში, აერონავტიკაში, ფარმაცევტიკაში, ტექნოლოგიებში, დიზაინში, განათლებაში, კულტურაში, ტურიზმში, გეიმინგში, კინოში და ა. შ. მონრეალში მდებარეობს სამოქალაქო ავიაციის საერთაშორისო ორგანიზაციის სათაო ოფისი, ასევე გაეროს მესამე სათაო ოფისი ნიუ-იორკისა და ვაშინგტონის შემდეგ. გარდა ამისა, მონრეალი მეორე ქალაქია ჩრდილოეთ ამერიკაში საკონსულოების სიმრავლის თვალსაზრისით. მონრეალი ატარებს იუნესკოს დიზაინის ქალაქის ტიტულსაც. 2009 წელს, საერთაშორისო კონგრესებისა და კონვენციების ასოციაციამ (ICCA) მონრეალი დაასახელა ჩრდილოეთ ამერიკის წამყვან მასპინძელ ქალაქად საერთაშორისო ასოციაციათა ღონისძიებებისათვის. 2015 წელს, ორგანიზაცია Economist Intelligence Unit-ის მიერ შედგენილ საცხოვრებლად ყველაზე კარგ ქალაქთა სიაში მონრეალი მე-14 ადგილს იკავებდა 140 ქალაქს შორის. თავის ისტორიის განმავლობაში, მონრეალმა მრავალ საერთაშორისო კონფერენციასა თუ ღონისძიებას უმასპინძლა, მათ შორის ექსპო-67-სა და 1976 წლის ზაფხულის ოლიმპიურ თამაშებს. იგი კანადის ერთადერთი ქალაქია, რომელმაც ზაფხულის ოლიმპიურ თამაშებს უმასპინძლა. ამჟამად, ქალაქი ყოველწლიურად მასპინძლობს ავტორბოლა კანადის გრან-პრის, ფორმულა ერთს, მონრეალის ჯაზის საერთაშორისო ფესტივალს და კომედიურ ფესტივალ Just for Laughs-ს. 2012 წელს, მონრეალს ბეტა+ გლობალური ქალაქის სტატუსი მიენიჭა. ↑ Old Montréal / Centuries of History (April 2000). დაარქივებულია ორიგინალიდან - September 28, 2009. წაკითხვის თარიღი: March 26, 2009. ↑ Climate normals for Montréal 1981-2010. Environment Canada. დაარქივებულია ორიგინალიდან - February 23, 2016. წაკითხვის თარიღი: January 2, 2016. ↑ C-11.4 - Charter of Ville de Montréal. Gouvernement du Québec. დაარქივებულია ორიგინალიდან - February 22, 2017. წაკითხვის თარიღი: February 21, 2017. ↑ Population by language spoken most often at home and age groups, 2006 counts, for Canada, provinces and territories, and census subdivisions (municipalities) with 5,000-plus population – 20% sample data. Statistics Canada. დაარქივებულია ორიგინალიდან - May 14, 2012. წაკითხვის თარიღი: January 25, 2012. ↑ Fouron, Farah. (2006)Annuaire Statistique de l'Agglomération de Montréal. Ville de Montréal. წაკითხვის თარიღი: October 1, 2011. ↑ LIVING IN CANADA: MONTREAL, QUEBEC. Abrams & Krochak – Canadian Immigration Lawyers. დაარქივებულია ორიგინალიდან - March 30, 2010. წაკითხვის თარიღი: November 4, 2009. ↑ (2005) Participatory Democracy: Prospects for Democratizing Democracy. Montreal; New York: Black Rose Books, გვ. 292. ISBN 1-55164-224-7. წაკითხვის თარიღი: June 5, 2009. 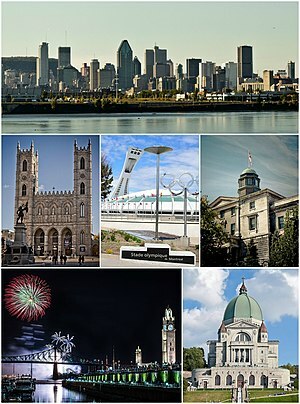 Quote: Montreal "is second only to Paris as the largest primarily French-speaking city in the world". ↑ Kinshasa and Abidjan are sometimes said to rank ahead of Montreal as francophone cities, since they have larger populations and are in countries with French as the sole official language. However, French is uncommon as a mother tongue there. According to Ethnologue, there were 17,500 mother-tongue speakers of French in the Ivory Coast as of 1988. Archived copy. დაარქივებულია ორიგინალიდან - October 21, 2012. წაკითხვის თარიღი: 2012-11-25. Approximately 10% of the population of Congo-Kinshasa knows French to some extent. Archived copy. დაარქივებულია ორიგინალიდან - November 27, 2012. წაკითხვის თარიღი: 2012-11-25. ↑ City of Toronto, History Resources. City of Toronto (October 23, 2000). დაარქივებულია ორიგინალიდან - April 29, 2011. წაკითხვის თარიღი: April 13, 2010. ↑ Wingrove, Josh. “Vancouver and Montreal among 25 most livable cities“, Globe and Mail, June 9, 2008. წაკითხვის თარიღი: June 19, 2008. დაარქივებულია ორიგინალიდან - June 10, 2008. ↑ Montréal 2025 | News | Montréal, top international convention host city in North America. Montréal 2025. დაარქივებულია ორიგინალიდან - May 14, 2011. წაკითხვის თარიღი: April 13, 2010. ↑ Herald Sun - EIU Livability Rankings. დაარქივებულია ორიგინალიდან - September 23, 2015. ↑ Montreal 1976. Olympic.org. წაკითხვის თარიღი: 2 January 2016. ↑ Circuit Gilles Villeneuve. Circuit Gilles Villeneuve Official Website. წაკითხვის თარიღი: 2 January 2016. ↑ Alpha, Beta and Gamma cities (updated 2015). ეს გვერდი ბოლოს დარედაქტირდა: 15:05, 6 ნოემბერი 2017.